Two people are being held by police in Tanzania after the seizure of a consignment of illegal ivory at Dar es Salaam port, officials say. Agents confiscated 81 tusks, from an estimated 41 elephants, the port authority and tourism ministry said. The tusks were fresh, meaning that the animals were killed in the last month. 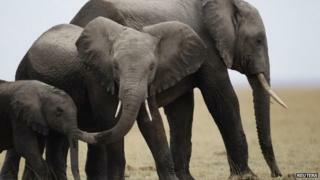 Tanzania's deputy tourism minister says the killing of elephants has increased sharply since a controversial anti-poaching operation was suspended. The security forces adopted a shoot-to-kill policy against poachers in October, but it was suspended a month later after an inquiry reported human rights abuses. Earlier this week, Deputy Tourism Minister Lazaro Nyalandu said 60 elephants had been "butchered" in November and December compared with only two in October. It is not clear from the port authority's and tourism ministry's joint statement where the cargo from Thursday's seizure in Dar es Salaam was destined. The police told the BBC they would give no further details in case it jeopardised their investigations. The Convention on International Trade in Endangered Species (Cites) banned the trade in ivory in 1989. But in recent years poaching has increased across sub-Saharan Africa with criminal gangs slaughtering elephants for ivory markets in Asia, where it is often used to make ornaments.